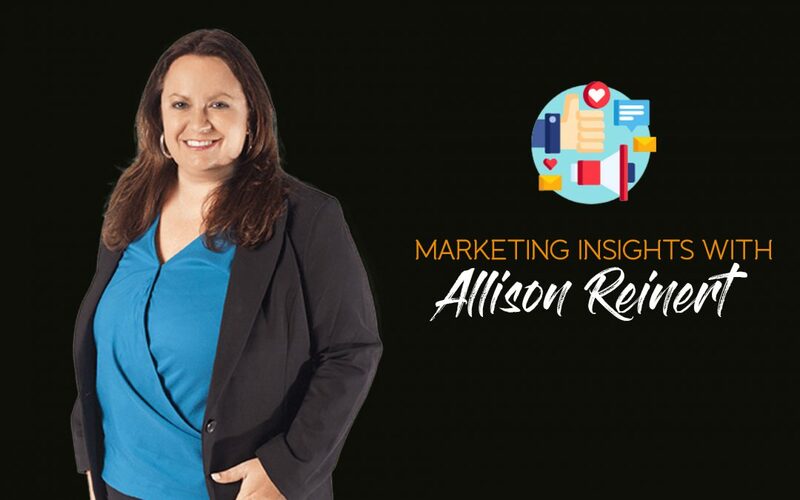 Here to discuss some important restaurant marketing components is Allison Reinert, Senior Marketing Partner from Cardinal Digital Marketing. Cardinal has partnered with some of the most recognizable healthcare, legal, restaurant and corporate brands in the country – including Papa John’s and Cox Media Group – helping these multi-location organizations strengthen their brand and broaden their reach. While they’re most proud of the work they do for their clients, they’re also honored to have been chosen as a Best and Brightest company to work for (2016, 2015, 2015) and as an Inc. 5000 agency (2016, 2015, 2014). What is the next big thing when it comes to marketing for the 2019 restaurant industry? Voice Search Optimization. With increases in people using voice search devices like Alexa and Google Home, it’s no surprise that voice search is on the rise. In fact, comScore predicts that by 2020, 50% of all searches will be conducted via voice. As a result, long tail keywords are beginning to have even more relevance, especially for mobile search. SEO strategy should continue to focus on optimizing for voice search. Voice searches are often conversational, such as “Siri, where is the best pizza place near me?” Previous SEO strategy would have focused on the short-tail keyword optimization, generally including location. Now, we have to think in terms of how people talk and ask questions. In the restaurant space, most voice searches will likely be generated from mobile devises. Therefore, it is also important that you have a strong local search presence, so your location is included in the Voice Search results. This including having optimized location pages on your website and having a strong presence in the Google Map Pack. Technology has been a primary focus for restaurants every year. What are your thoughts about utilizing tech tools in the restaurant world? What’s a must-have when it comes to marketing? I think there is opportunity for the restaurant industry to benefit from new and rising technology. Advancing technology, like autonomous vehicles (i.e. self-driving cars) delivering food could be a wave of the future. However, for now, I’d focus on technology that is going to help generate new customers or increase your sales in 2019. For example, are you posed to handle digital ordering and delivery? There is a rise in third-party options for both. Software to handle both fulfilling and delivering orders can be very cost effective. Technology to handle payments easily is also a must. Whether you’re a traditional brick and motor location, or operating a food truck or festival booth, you need to be able to process credit cards. There are many options now that can attach to a smart phone or tablet and swipe a card. Additionally, look for Point of Sale (POS) software that integrates with your payment processor. There are programs that will let you take orders, track sales, manage cash flow, and track inventors and orders, across multiple locations. I recommend looking for “all-in-one” options that will keep you organized and efficient. 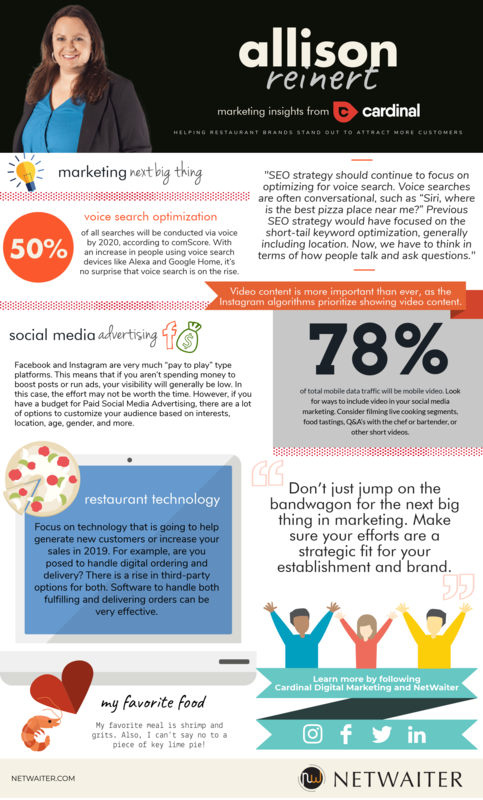 What about social media – do you think having a social presence is important for a restaurant’s brand and identity and why? My advice for social media is that if you’re going to do it, do it well. Having an Instagram account with a couple pictures and no frequent posts doesn’t make sense. However, if you can commit to being active on the social channels, then if can be beneficial. The social networking site Nextdoor is extremely popular within some local communities. So, make sure you know whether people near your location are active on that network. “Neighbors” may be talking about your restaurant, and you want to be sure you know what they’re saying. Facebook and Instagram are very much “pay to play” type platforms. This means that if you aren’t spending money to boost posts or run ads, your visibility will generally be low. In this case, the effort may not be worth the time. However, if you have a budget for Paid Social Media Advertising, there are a lot of options to customize your audience based on interests, location, age, gender, and more. Video content is more important than ever, as the Instagram algorithms prioritize showing video content. According to Instagram (2018), “By 2021, mobile video will account for 78 percent of total mobile data traffic.” So, look for ways to include Video in your social media marketing effects. Live video streams are also great to include in the mix. Consider filming live cooking segments, food tastings, Q&A’s with the chef or bartender, and more. What piece of advice would you give to any aspiring restauranteur-turned-marketer? Focus on understanding the market and customer base for your restaurant location. Also, find what you do best, and excel at that. For example, if you own an upscale seafood restaurant in a suburban setting, then your client base will likely differ from an upscale seafood restaurant in a downtown setting. If your client base isn’t millennial, then focusing on Instagram or Snapchat may not get you in front of the right people. Don’t just jump on the bandwagon for the next big thing in marketing. Make sure your efforts are a strategic fit for your establishment and brand. And a fun question! What’s your favorite meal? My favorite meal is shrimp and grits. Also, I can’t say no to a piece of key lime pie!